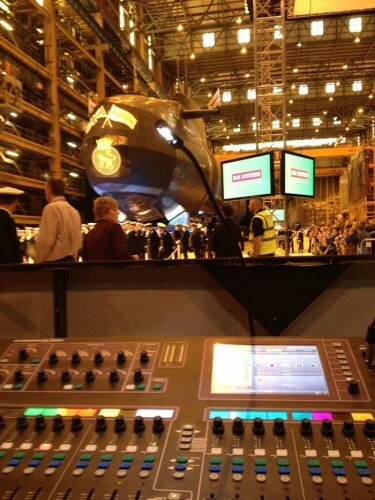 Manchester-based hire company, ACE PA, recently employed an Allen & Heath GLD-80 with accompanying AR2412 and AR84 I/O expander racks to manage the launch ceremony of a new submarine by BAE Systems in Barrow, Cumbria. Named Artful, this is the third submarine to be constructed at BAE for the Royal Navy. "I had feeds from VT and a local band performing at the event, plus there were six handheld radio and lectern mics for the ceremony," explains ACE PA MD, Gary Jones. "I had the AR2412 24-channel rack on ground level, and the AR84 8-channel rack on the mezzanine with media for the send and return feeds. I set the 4 outs on the desk as Aux feeds for the TV news media, which came to film the launch and set up next to me. The BBC camera man commented on the nice clean feeds - job done!" 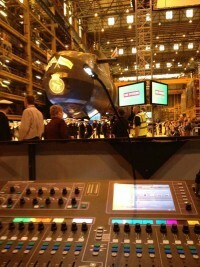 In picture: Gary Jones from ACE PA with the GLD-80 at the launch event.